Eufy, the Anker sub-brand that has a focus in the smart home arena, dropped prices on its three of its best products today at Amazon. Right now, you can get the Eufy Genie (an Amazon Alexa speaker), Eufy Smart Plug, or the Eufy Lumos Smart Bulb for at least $9 off. And remember, these products are already priced well, so now we’re talking impulse-buy-price territory. The Eufy Genie is now just $24.99 (normally $34.99). It’s a hands-free smart speaker with Amazon’s Alexa built-in. So you can control your smart home, play music, ask Alexa questions, etc. It compares to the Echo Dot, which costs $40. The other two products would work well with a Genie (or Echo or Google Home and Assistant). 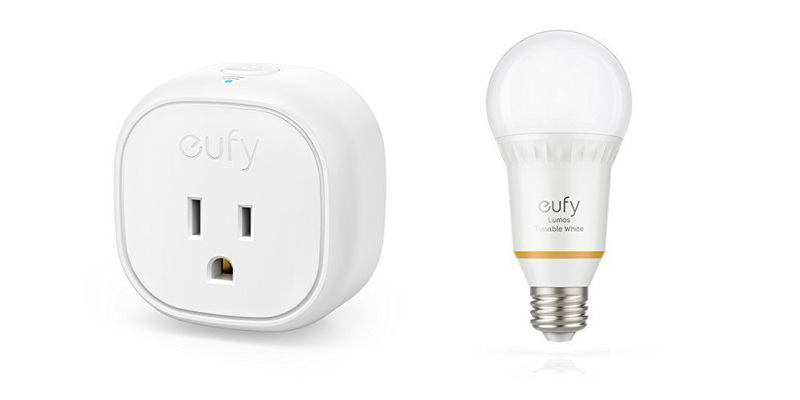 The Eufy Smart Plug is now just $13.99 (normally $22.99), connects over WiFi in your home, is setup using the EufyHome app, and can be controlled by voice using your favorite assistant. Same goes for the Eufy Lumos Smart Bulb, which is now just $17.99 (normally $26.99). This is the “tunable” model that can has ambiance adjustment and also works within the EufyHome app or your favorite assistant. Crazy good prices on all of these right now. Time to get that smart home going.